For those who have searched for an inexpensive rifle scope and have considered purchasing a scope from Osprey Global, this thread will serve as a one stop shop. Please post your experience or questions regarding these scopes here. Your link to you tube does not work. That's allot to type from an iphone. You broke the cardinal rule: never buy a scope at a gun show! Sorry it didn't work out. There is usually a very, very good reason why people haven't heard of a particular manufacturer. Expecting an awesome scope with great features at <$300 is not going to happen. If you need something good in that price range, look at the SS10X. It isn't illuminated, it is fixed power, and it will run like the energizer bunny. Everyone hopes for the "too good to be true" deal, but they are aptly named. Damn...Funny I should come across this today. Bought 2 of them at the gun show 2 months ago...same guy...the 6-24 I bought is OK..nut the 4-16 will not focus..I e-mailed them ..hope I get a reply! So, I read this thread with great interest. I have had nothing but trouble with my Osprey Global (OG). I made the mistake of listening to a pretty girl at a gun show and bought one. I was promised full warranty and that she and her husband (who owned the local distributorship) would stand behind the product 100%. I took off my Nikon Buckmaster scope (an awesome scope that has never failed to produce one inch groups at 200 yards) and replaced it with the OG with great hope. It would never produce better than three inches at 100 yards after 60 rounds of Fusion 165 grain 30-06. Before you say it, I know I was a dumbass for taking the Nikon off. Who replaces a scope that is that accurate...right? I contacted the sales rep at two follow-on shows and they refused to assist, only referring me to the manufacturer for satisfaction. Not only would the local Decatur vendor not refund me, I had to go to a third show to convince them to even replace it. Now, I have a 3 - 9 X 40 scope that I don't trust, will never mount and would prefer to use as a hammer rather than a scope. So, reading previous entries, It appears that OG has a tendency to threaten legal action against those who tell their stories of woe about this unreliable product that they refuse to back as stated in their warranty and by their vendors at shows. Well, hopefully they will soon see that producing a quality product and ACTUALLY standing behind it instead of litigating would go much farther toward producing a loyal following than selling crap and threatening disappointed customer will. I appreciate the complement of you thinking I'm pretty but I can assure you I am far from naive. The only way I would have referred you back to osprey themselves would be if You did not have the scope with you at the show and wanted the situation resolved before the next show in the area. 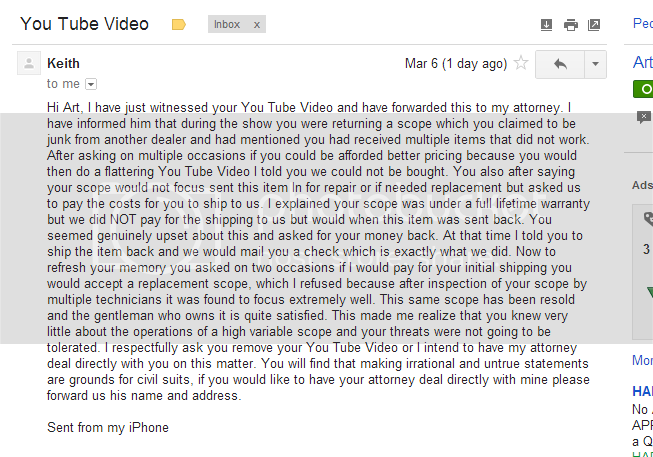 OR You wanted a refund on a $100 scope. I would have told you the unit itself would have to be actually tested by the manufacturer to assure it was not user error for an actual refund. Once you actually brought the scope back my husband gladly swapped it out for you. I can assure you, I wouldn't have given you the run around on a scope. I also give out my business card with my personal phone number and email to be contacted! I will say, I then put the exact scope your claiming wouldn't hold a tight group on my personal rifle.I was doing quarter inch groups with this scope, no problem. If you would like, I personally will come help you sight in your rifle with this scope. I don't mind helping my customers! Please let me know so I can help you out. My son amd i went to a local road runner gunshow in September 2016 and he vought a osprey 6x24x50 lighted reticle with ffp plane mildot ..The plan was to mount it on his 300 RUM and we asked the rep if the scope could handle the recoil and we were assured it would.Well now leas than 100 rounds after the initial purchase the variable magnifcation ring is frozen and wont move.That and the eye relief is terrible everyow who fired this magnum with this scope has been bit at one point I thought I would need stitches.So i dont have a high opinion Osprey scopea at all. Ahh, the golden oldies. I love these old threads, the product bashing, the "I can shoot 1 inch groups at 1,000 yards all day", the flame wars. Youth is indeed wasted on the young. The take-away from these is always the same: buying something you've never heard of from someone you don't know (trunk of car roughly equals gun show booth) at a price too good to be true - it almost never works out well. Next time you think about buying a $100 scope with illuminated FFP reticle and target turrets and quality guarantees, just burn the $100 bill and call it good. There are very high quality inexpensive scopes, and their are garbage expensive scopes; it's a tricky venture purchasing optics, and we are happy to assist. [QUOTE=Rancid Coolaid] Ahh, the golden oldies. I love these old threads, the product bashing, the "I can shoot 1 inch groups at 1,000 yards all day", the flame wars. Youth is indeed wasted on the young. Well i ended letting my son use my diamond back hp and guess what no problems no matter what he feeds his rum they are all under 1.00" and I took the plunge and bought a Minox xi5x5x25x56mm and I couldn't be happier ecspicially with my aging eyes and severe retinopathy. I contacted Nsmyth. Several PMs back and forth. She and her husband live not too far from where I work. I offered to meet her and her husband and go shooting with them. Let them demonstrate the scope to me... conditional on the provision of a scope for me to take and perform a full evaluation. Never heard back from that communication. Perhaps they are just too busy. Damn, I miss the old days around here. The answer to your “how are they still in business” question can be found in the “I just bought a scope from them” portion of your post. 😂😂😂 Mr. Barnum strikes again.